So we’re gearing up for the Happy Homemade Sew-along! It’s the week of June 16-20. By now, you should either have the book in your hands or maybe you’re waiting for it arrive. 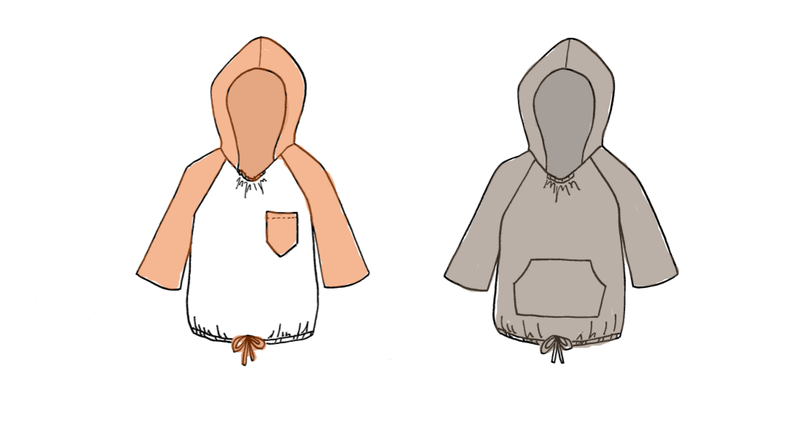 Today, Meg and I have some hoodie inspiration for you so you can start planning YOUR hoodie. One of the reasons we picked this pattern to sew, is because the possibility for simple modifications is endless! 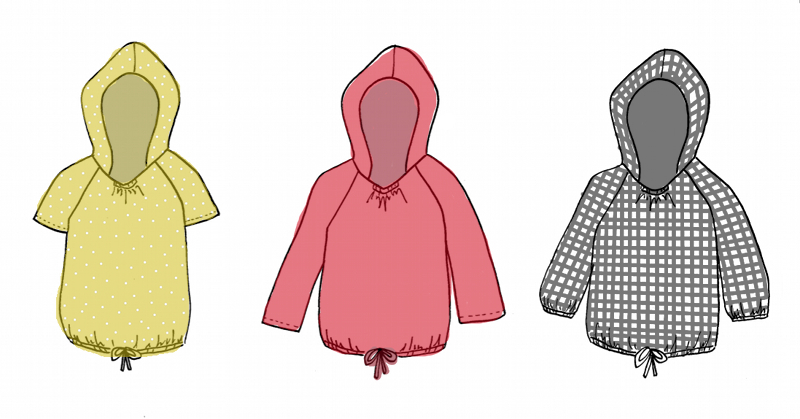 Now there is nothing wrong with sewing up the pattern exactly as directed, but if this isn’t your first time sewing this pattern or you are looking for something a little different, here are some ideas of ways you can mix up the pullover parka pattern. 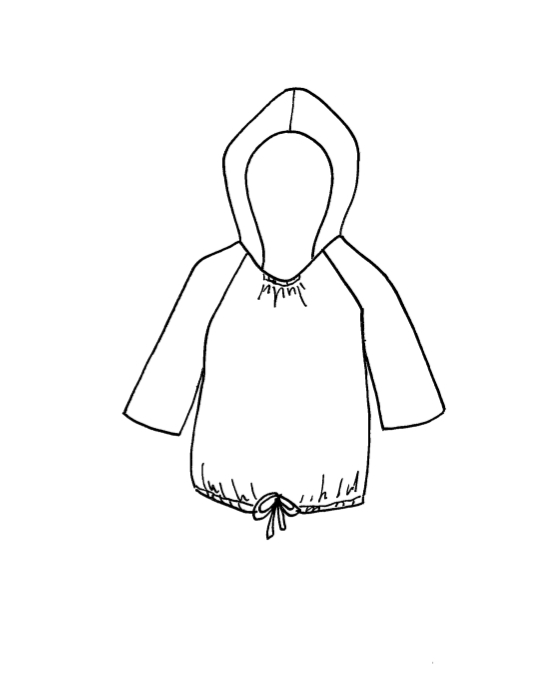 The original pattern features a hood, 3/4 length sleeves, a drawstring for the bottom and a partial elastic neckline. Let’s talk about some ways you can mix it up! Two easy modifications is to change the length of the sleeves to make either a short sleeved or long sleeved top. Or, you can lengthen the sleeves and make an elastic casing for a gathered cuff. Instead of adding a drawstring along the bottom hem, you can use elastic for a similar look but without the hassle of tying. Or you can just hem it regularly and omit that gathered hem altogether. By lengthening the hoodie and extending the side seams into a slight A-line shape, you can make this into a hooded dress! Adding pockets is another simple and practical way to update this pattern. You can add a patch pocket, a kangaroo pocket, in-seam pockets or even welt pockets. The raglan style sleeves of this pattern naturally lend themselves to color blocking. You can chose different fabrics for the sleeves, the hood and the front and back. If you are comfortable modifying your pattern to break it into segments for color blocking, that just opens up a bazillion new combinations and possibilities. You probably know by now that I am a big fan of fabric stamping, stenciling and painting to create one-of-a-kind fabric and garments. Well this is the perfect opportunity to add your unique mark to a piece of clothing for your kid! And how much would your kid love it if you added something they are really into? This pattern is perfect for adding applique or embroidery. And have you seen my Panda Raglan Tee tutorial?? ANIMAL HOODIE, need I say more? Well, there are some ideas to get your hoodie planning started. And like I said, you don’t need to make any modifications to the pattern to make an awesome hoodie! The easiest way to make your garment “you” and unique is in your fabric selection. 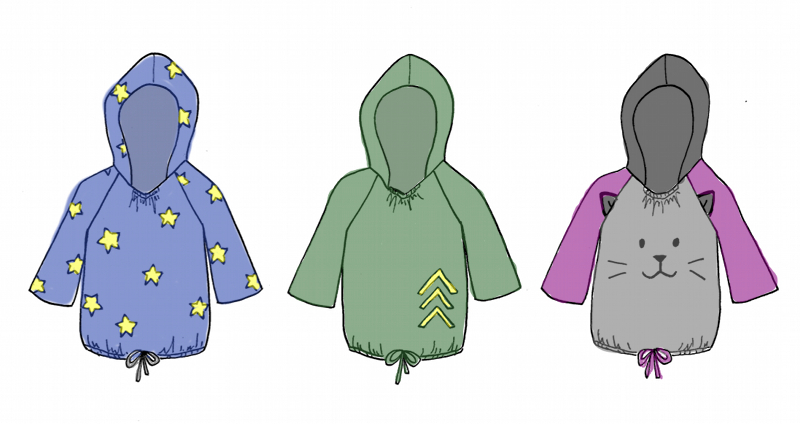 We’ll be talking more about fabric next week, but in the meantime, why don’t you download this blank hoodie template and start brainstorming ideas for your hoodie!? You can either right click/control+click and select “Save Image As” or download a PDF version HERE. Print it out and grab some pencils, markers, or paint to play with different ideas for your hoodie. Be sure to check out Meg’s post for a round-up of hoodies to give you more inspiration. Check out your fabric stash. Play around with colors. This is just for fun so you can make your picture as realistic or outrageous as you want. Then upload your picture to the flickr pool or post it on Instagram and tag it with #happyhomemadesewalong so we can all be inspired by YOU! This entry was posted in Happy Homemade Sew-Along and tagged happy homemade kids sew-along, modifications by Cherie. Bookmark the permalink. 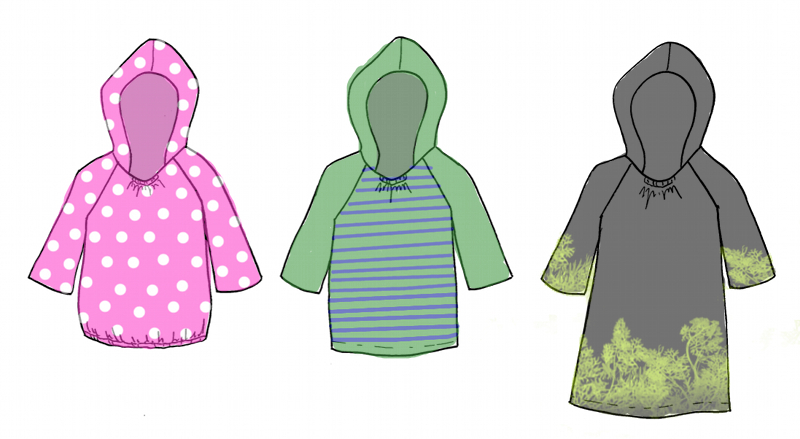 Pingback: elsie marley » Blog Archive » happy homemade sew-along: hoodies! These are cute as can be! Yay! So happy to see you’re doing this pattern. I cut one of these out over a year ago. Sewed about half of it, including sewing one of the sleeves on upside down – twice, with a French seam! Then I never got around to finishing the hood. I hope I can join in and finally finish it (and that it still fits). so many great ideas for modifications! I now make this one without the drawstring at the bottom because my daughter prefers it loose – and easier for me! I think I would love to try the dress version – great idea! Oh many I’m getting more and more excited here. I just can’t decide what materials and design to do…. Maybe I’ll get my boys to help with that! This is good information! Tanks for sharing-check out our rug cleaning tips sometime!! Hopefully participating in this sew along! Anyone wanna join me? So cute! My book arrived today! Yay! 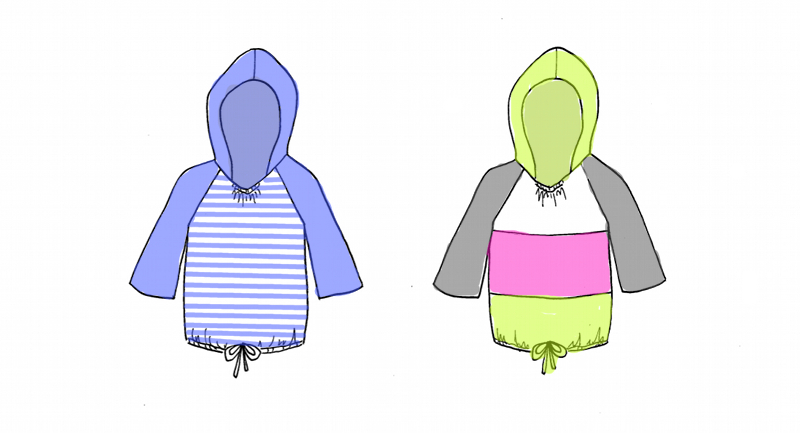 Pingback: elsie marley » Blog Archive » happy homemade sew-along: the hoodie!